HitFilm 4 Pro is out now and you can start using it immediately. As you’d expect, it’s packed full of massive new features and improvements. All your 3D shots now look better. New lighting method – 3D models can now be rendered more accurately as different physical materials, from plastics to metals, with fine control of light bouncing off surfaces. Take a look at the video up top to see it in action. Dynamic reflections – objects can now reflect each other and their surroundings! If you’re working with something shiny, like a polished vehicle, this is a big deal. Diffuse lighting – if you have a 3D model near a large green wall, the green light reflected from the wall will now spill onto your model. This creates very natural lighting without having to create complex setups of 3D lights. In other words, your lighting looks better without you having to put in much extra work. Global ambient occlusion – The AO system to cast between different 3D layer types has been upgraded. That means that you can put a 3D model on top of a plane in HitFilm and you’ll get realistic occlusion. Especially useful if you’re using shadow catchers to composite into live action. HitFilm’s celebrated unified 3D space has also been enhanced with the implementation of soft particles. This allows you to surround a 3D model with particles without seeing hard texture edges – the result is very natural, convincing volumetric particle simulations. Shiny things are good but HitFilm 4 Pro isn’t only about things looking prettier. It also introduces a new level of control and precision in the completely rebuilt animation system. Animation paths can now be fine tuned using bezier handles in the Viewer, making it easy to adjust the exact shape of a curve or switch to a fully linear move. Then there’s the brand new animation value graph, which truly revolutionizes your HitFilm projects. It’s a visual representation of how your keyframes change over time, making it easy to adjust the exact pace of change. Want an animation to start quickly then come to a gradual, slow stop? That’s now super easy. Whether you’re animating a spaceship coming in for landing or a title flying onto the screen, you’ll find yourself using this feature in every project. HitFilm 4 Pro now supports an animation format called Alembic, which makes it possible to import pre-animated 3D models. This allows for far more complex animations to be rendered in HitFilm, while retaining full 3D compositing capabilities. Think of it like 3D stock footage – you can now import a T-Rex with a complex walk cycle and composite it inside HitFilm, retaining full camera and lighting control. Plug that into the particle simulator and you’ve got yourself several dinosaurs. They do move in herds. If you’re a motion graphics artist or want to make a cool title sequence, HitFilm 4 Pro has major new features to help you out. FXHOME have teamed up with Boris FX to include the 3D Objects plugin, which delivers advanced titling with complete control over font rendering, extrusion, beveling, distortion and animation. It’s usually $299 on its own, but it’s now included with HitFilm 4 Pro. FXHOME are currently working on full interaction between Boris FX and HitFilm’s cameras and lights, which will be added in a free update in early 2016. The particle system has traditionally been a chaotic system best suited to visual effects. 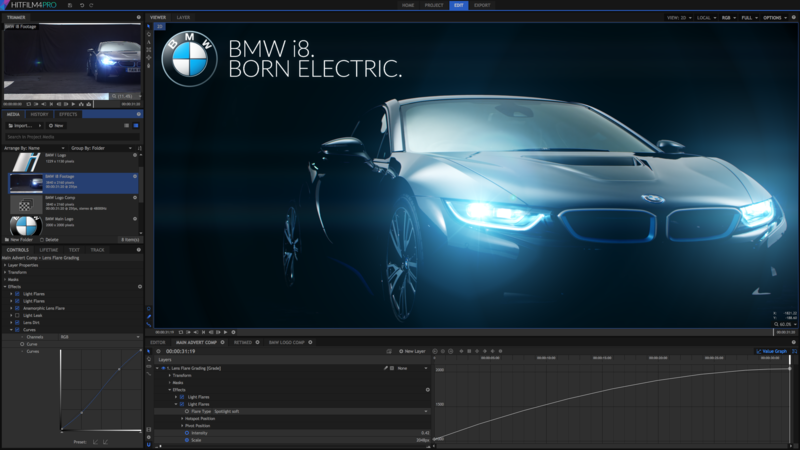 It now has a grid emitter option, which instantly transforms it into an enormously powerful mograph tool. Particle births are restricted to specific grid positions but can still then be affected by physical forces and deflectors. That's not all! Editing video and audio in HitFilm 4 Pro is a completely new experience. Variable playback – you can now play your timeline forwards and backwards at varying speeds and we’ve updated the shortcuts system to support traditional JKL control. If you’re coming from another editor like Premiere Pro you’ll feel right at home. Rate stretch – change the playback speed of any clip or layer using this fast tool or in the new Speed/Duration window. Audio effects – there’s now a built-in equalizer and fast noise reduction, plus a range of classic ambience presets. The most unique addition is Doppler Shift, which automatically adjusts audio based on the movement of a 3D layer. Attach a helicopter noise to your animated 3D model and HitFilm will work out the positioning. The FXHOME effects plugins for third party hosts are now packaged up as the new HitFilm Ignite collection, included as part of HitFilm 4 Pro (also available separately). Purchasing HitFilm 4 Pro makes all your other video software better, too. Premiere Pro, After Effects, Final Cut Pro X, Motion, DaVinci Resolve, Vegas Pro and Catalyst Edit are now supported, and they're working with Grass Valley to support EDIUS Pro 8 in the near future. HitFilm 4 Pro continues to fully support OpenFX, opening the door to great products from GenArts, Red Giant, RE:Vision and New Blue. And, of course, Boris FX and Imagineer Systems, with their Academy Award-winning planar tracking technology in mocha HitFilm. Take a look at our product page for even more details about HitFilm 4 Pro.